Ecology may be defined as the “study of the interrelationships of organisms with their environment and each other.” The term human ecology was first used in 1924 by Robert Park and Ernest Burgess in their Introduction to the Science of Sociology. However, Amos Hawley’s 1950 book, Human Ecology: A Theory of Community Structure, is the definitive exposition of the field, and sets out the subject matter of human ecology and its approach. In this chapter we review and discuss the four referential constructs of population, organization, environment, and technology, sometimes referred to as the POET complex. The unit of ecological analysis is the human population, circumscribed more or less in a territorial fashion. Since much of the empirical literature of human ecology in recent decades has focused on demographic applications, we then outline the focus of ecological demography, as an aggregate perspective for undertaking analyses of fertility, mortality and migration. 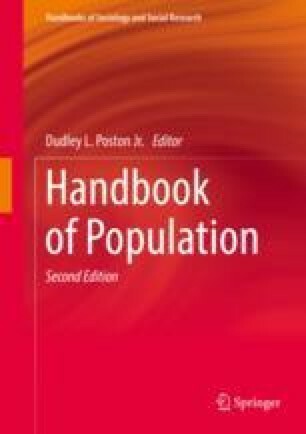 My colleague and close friend Parker Frisbie co-authored with me in 2004 the initial draft of this chapter, that was published in 2005 in the first edition of the Handbook of Population. Parker passed away in February of 2018 and was not involved in the writing of this version of the chapter, which occurred mainly during the fall months of 2018. However, much of Parker’s work writing the chapter with me in 2004 remains in this version. I have retained him as a co-author, and remain saddened by his death. Poston, D.L., Jr. and Chang, Y.T. (2016). Patterns of gay male and lesbian partnering in the metropolitan areas of the United States in 2010. Frontiers in Sociology: Evolutionary Sociology and Biosociology, 1: https://www.frontiersin.org/articles/10.3389/fsoc.2016.00012/full.